Home / Football / WC Diary 10: The Best Team Won; and Obrigado Brazil! Ah yes… I should be doing punditry for a living! I got my World Cup semi-finals predictions correct; and although I was anxious for the entirety of this morning’s final – Philippine time, of course – I got the finals correct as well! And the moral of the story for me is something that I honestly already knew from thirty years of coaching high school kids but somehow forgot because of the intensity of the occasion – that one should never slag off a player for a mistake while a game is going on because he can just as easily be the game-winner just moments later. So thus, Mario Götze was my nominee for village idiot moments after he came on late in the game for the legendary Miroslav Klose. The Argentines uncharacteristically lost possession in the middle of the park, Götze latched on to the ball and had a run at goal. Thomas Müller and Andre Schürrle were quickly sprinting forward to offer support; and frankly a lay-off to either would have been the better option. But the entirety of the World Cup was a most beautiful thing, not just the football that the teams played but the colour that the Brazilian nation gave it. I, for one, will remember this World Cup for many, many years to come. But Götze lost his head and went for glory, his long distance shot so lame even my grandmother would have saved it. And my grandmother has been dead for decades. Fast forward to the 113th minute – or just seven minutes from the end of extra time and the dreaded penalty shootout – and Schürrle somehow found the legs to out-sprint two Argentines down the left before delivering an inviting cross into the middle. The Argentine defence had been compact for the entirety of the game up to this point; but the speed of Schürrle’s break left the midfield stranded upfield with only two central defenders protecting Sergio Romero in goal. For once, Ezequiel Garay and Martin Demichelis were well-spaced from each other. Schürrle’s cross could have gone anywhere, as footballs have this silly habit of disobeying tired legs. But no! It ghosted between the two Argentine central defenders where, of all people, my village idiot collected it on his chest before launching himself on a flying volley to steer the ball past Romero and into the net. It was as delicious a goal as my famous adobo; and suddenly my village idiot was hero of the game! With a mere seven minutes remaining, it was game, set and match Germany because, much as Argentina’s defensive organisation was one for the tactical videos, going forward they were almost totally bereft of aesthetic value. I believe they contrived no more than three meaningful chances in regulation time or just one in 30 minutes. Ironically, all three were genuine chances which could have shattered Teutonic dreams if only the gentlemen who took each were not as celibate as your parish priest. Anyone among Gonzalo Higuain, Rodrigo Palacio and one Lionel Messi would have earned the right to return to Buenos Aires as hero if only he knew the way to the gates of glory. One Internet article quotes Messi as laying the blame on his team’s strikers for the defeat; and to be fair, Higauin’s miss after latching on to Toni’s Kroos’ horrifying blunder midway through the first half was as embarrassing as an Anne Curtis peek-a-boo. On the other hand, Messi’s miss late in the game was something Liverpool’s Jon Flanagan would have scored with his eyes closed. Flanno is a defender, by the way. And of course, I am exaggerating just to emphasize my point. When the same Messi skied a promising freekick late in extra time into Row Z, that more or less summed up the little Argentine’s World Cup. He was probably given the Golden Ball for almost single-handedly carrying his team to the final; but there were a few in the German team that probably deserved it more. 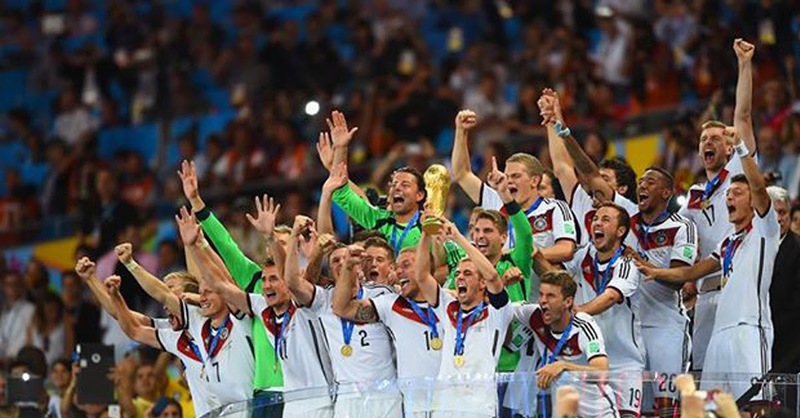 Frankly, the best team won the World Cup. And while Messi is arguably the most talented player of the generation, this World Cup was not his tournament. There were many more who played better. For the record, I like Messi so much more than I ever liked Diego Maradona, if at all. I am old-fashioned in many ways and I personally believe that there is so much more honour to finishing a tournament as bridesmaid than winning it but partly with the hand of God and partly with the head of Diego. Like God ever needs to cheat. So revelry in Berlin and tears in Buenos Aires. That is the way it goes in football or any sport for that matter. In any sport, there has to be winners as well losers. I just feel that I have to say a word about the Brazilian public. I was never a Brazil fan to begin with; but I felt for the team and its supporters after the embarrassing surrender to Germany and the equally feeble effort against the Dutch in the play-off for third place. The final, too, was for the Brazilian public an appetite-depleting choice between the devil and the deep blue sea. To support Germany would have been to rally behind the very same team that caused them so much anguish. On the other hand, to support Argentina was pretty much like asking a Liverpool fan to support Manchester United. Duh! There were those who were quick to criticise the Brazilian team for having forgotten joga bonito – football as a thing of art, a thing of beauty. On the pitch, perhaps; and indeed, even with Neymar on, the Brazilian team never looked like a work of art. So while Germany might have lifted the Jules Rimet Cup, in retrospect Brazil might have actually won something more prestigious – the respect and admiration of the global football community! I have enjoyed this World Cup so much that I actually dread waking up tomorrow knowing that Braziil 2014 is now a thing of the past. Obrigado Brazil! Very well done indeed!